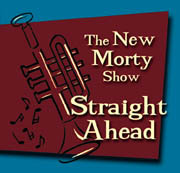 Modern swing revivalists, The New Morty Show, fronted by Morty Okin, delivers rocking swing beats on Rigormorty, while delving into the cocktail-lounge-jazz on Straight Ahead, two albums released only months apart from each other on Arizona's major-label distributed Slimstyle Records. Rigormorty will find you quickly swinging into action, dealing an unbeatable hand of sharp, warm horns, male/female vocals that are both slick and stylish, and a punchy rhythm section that isn't afraid to kick things into high gear. "Hungry Wolf" is driven by the punk rock guitar intro before breaking into a warm-hearted swing number by the light of the organ. "In The Groove" bounces back and forth with rock drumming taking the steering wheel ahead of the bright horns and the smooth vocals. And "Ladies Man" tones things down a notch as the band gives you a taste of what they can also do - cocktail swing - as Straight Ahead quickly proves. Straight Ahead is a delightful mix of warm, vibrant jazz music and silky, seductive cocktail lounge. 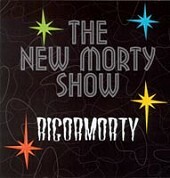 After hearing Rigormorty, you might be quick to write the band off as a rock 'n' roll act trying to cash in on the swing craze (a year late, even). After all, it has more rock influences than swing influences. But, after hearing tracks like "Destination Moon" and "No More At All," you'll instantly see the band for what it is, a modern swing act that loves the past but isn't afraid to re-create it for the present and beyond. I'll give Rigormorty a B and Straight Ahead an A-.